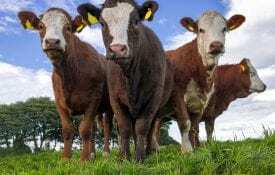 The occurrence of grass tetany is most often seen with lactating beef cows, particularly during peak lactation, and with older cows in the herd. Older cows may be more susceptible than younger ones. This is because the body reserve of magnesium, found in bones, may be less in older animals. Although lactating animals are the most susceptible, dry cows and stocker cattle may be affected under the right conditions. Tetany’s physical symptoms may not be noticed until an animal is down or dead. However, at the onset, the cow may show signs of nervousness, excessive salivation, muscle tremors, and rapid breathing. In advanced cases, the animal will collapse, go into convulsions, and die. Cereal crops such as wheat, rye, and oats are low in magnesium content, especially in the spring and fall. Soil low in magnesium will cause low magnesium content in plants. High levels of some other elements, such as potassium, will cause a sharp drop in the plants’ uptake of magnesium. The magnesium level in forage decreases with cold temperatures or cloudy weather conditions that favor fast growth. Low dry matter content along with high concentrations of nitrogen in forage decreases the magnesium level in blood serum of cows eating such forage. High potassium along with high nitrogen is more dangerous than either one alone. When forage and/or blood calcium levels are low, tetany can also occur. 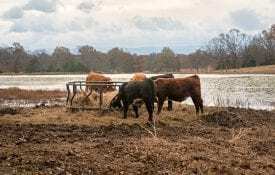 Because grass tetany is due to a reduction in magnesium available for the animals’ use, a number of methods have been used to increase consumption. Properly balanced fertilizers and magnesium compounds have also been applied to the soil to increase the plant magnesium level. 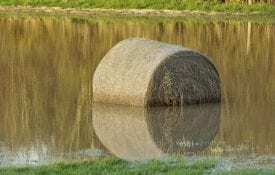 The use of dolomitic limestone, which contains magnesium, may increase forage levels when (1) a soil pH increase is needed and (2) soil magnesium is low. Magnesium oxide can also be included in fertilizer application packages and may increase the level of magnesium in plants. All of these are helpful but are less economical and are not as effective in preventing grass tetany as a direct supply of magnesium to the cattle. The real problem is not necessarily low magnesium content of the soil and plant but reduced absorption of magnesium from the digestive tract of the animal. Note that selecting a mineral supplement containing calcium is especially important in situations where grass tetany may pose a risk. Cattle should consume 1 ounce of magnesium oxide daily, and their intake should be checked frequently. Magnesium is not stored in the body long, so daily consumption is important. Direct supplementation of magnesium, such as a combination of trace-mineral salt and magnesium oxide in a 1:1 ratio, may provide an additional option for increasing magnesium intake. Mixing equal parts of a high-energy feed such as ground shelled corn, trace-mineral salt, and magnesium oxide may improve consumption because cows do not like the taste of magnesium oxide (i.e., due to its bitter, metallic taste). Do not mix with protein supplements or other high- nitrogen feeds that may further aggravate tetany problems. Consumption can be improved by mixing equal parts by weight of ground shelled corn, trace-mineral salt, and magnesium oxide. Other grains or dry molasses that are high in energy may also be used to increase consumption. Do not use protein supplements, meals, or any sources of nonprotein nitrogen. High nitrogen feed ingredient would tend to aggravate the grass tetany problem. Treatment of tetany can be successful if started early and if the affected animal is not handled too much. Recommended preparations and dose rates vary widely depending on the conditions that apply in each case and on the size of the cow. When signs of tetany occur, contact your veterinarian as soon as possible. †Some levels may be somewhat lower or higher than on commercial mineral labels. Many formulations exist and may be usable in your situation. 14% CP) or cool-season annual mixtures (65% TDN, 16% CP). *Given phosphorous fertilization according to soil test recommendations. Note: Pastures with high levels of soil P may not require P fertilization or higher levels of P in mineral supplements. 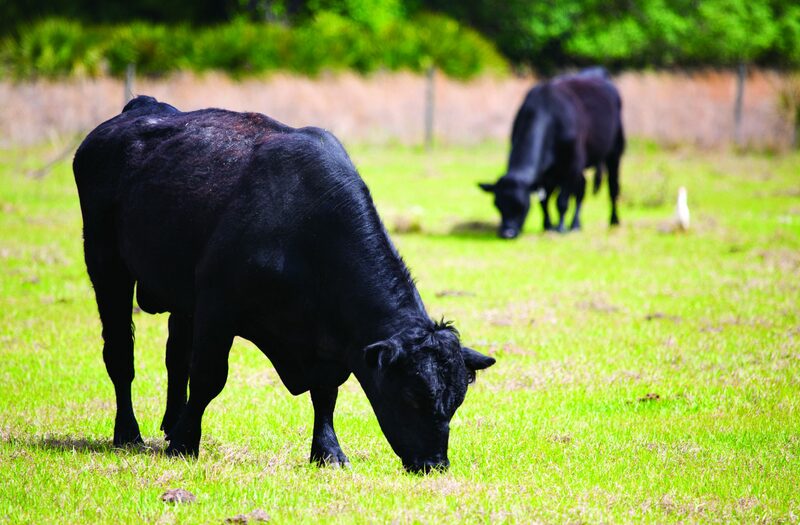 Download a PDF of Management Practices to Reduce Grass Tetany, ANR-0495.